Scones are out and Portuguese tarts are in... I wonder why? 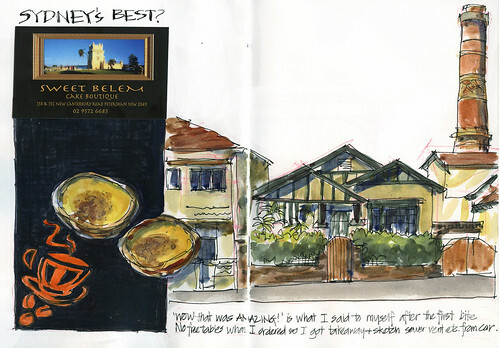 Got takeaway and then sketched in my car - view on my lap and view out the window. Earlier in the week I had high tea at my favourite tearoom (t2 teahouse) with my Scottish sketching friend Eza (who has now left to go home!) 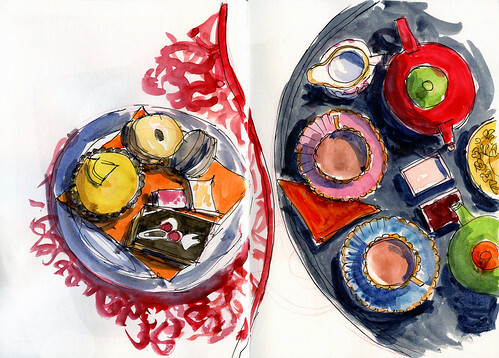 We spent so much time sketching that we didn't even eat the cakes - only (!!??) the sandwiches, quiches and scones. A full description of what we were provided with is here. The diet starts on Monday - truly it does!! !